peanut butter Archives - THE OLIVE BLOGGER - Recipes your family will love! Okay guys I can’t even pretend to hide my EXCITEMENT that the 13 Days of Christmas Baking is back!! We are starting it off with a bang with a delicious truffle recipe with everyone’s favorite ingredient: peanut butter! I have literally been thinking up ideas and baking away for the past 365 days in preparation for this years list…and I even have some fellow bloggers along this year to share a cookie or two from their recipe box! Are you excited now!? I know, Christmas is still a few weeks away, but guys so many of these goodies can be made far in advance so you can freeze them and put them away for your Christmas trays (woohoo, anything to save time closer to the holidays and I am one happy girl). So, be sure to follow along for the next couple of weeks to see all 13 Days of Christmas Baking and let me know which goodies you make!! I will also be sharing a few gift ideas and guides to make your Holiday Season even more stress free (you’re welcome)…and if you are like me, you have a TON of people to make trays for, I will be sharing some VITAL tips for packaging and sending your cookies away for their journey. So, are you ready to get baking?! Today’s goodie is a delicious Peanut Butter Pretzel Truffle Bite (adapted from Restless Chipotle). It is so easy to make, literally it takes 10 minutes to put together (plus chill time) and it will blow your mind! The peanut butter mixes with the pretzels to give a nice crunchy texture and then is covered in a delicious milk chocolate coating, sending your taste buds into Elf Town! Mmm! I tested out the recipe and made enough to bring to a family event, where they were DEVOURED…everyone is still asking me to make them again, but they will have to wait for their Christmas trays! 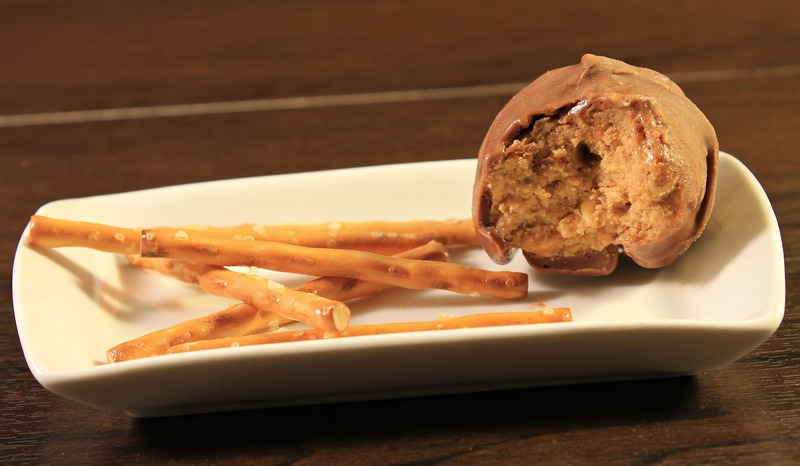 A delicious "truffle" filled with peanut butter and pretzels and coated in chocolate! They take 10 mins to make and are guaranteed to be a hit with all! 1 tablespoon unsalted butter Room temperature. 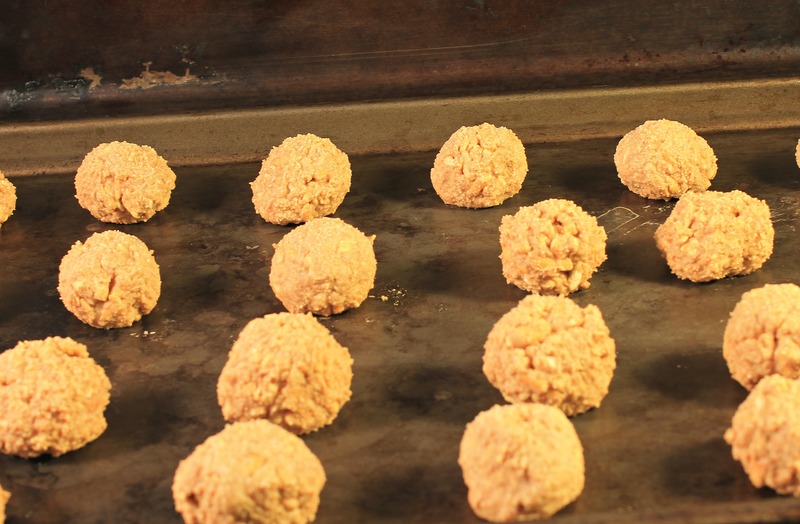 Form small sized balls using your hands (about 1" diameter) and place on a cookie sheet. Freeze until very firm, about 30 minutes. Dip the balls in the chocolate. Place back on cookie sheet and into the fridge to firm up. You can then transfer into truffle cups for a nicer display for gift giving! 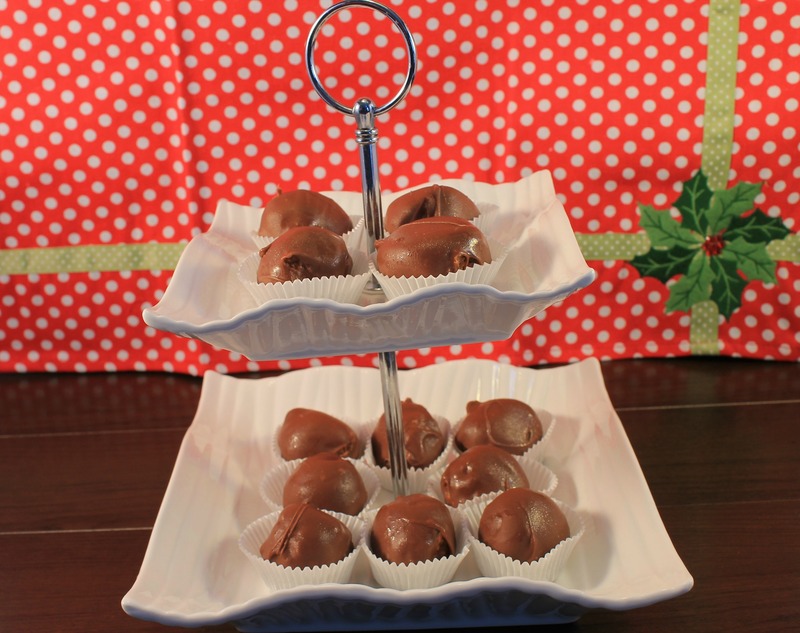 Place the dipped bites into the freezer to firm them up quicker if you are short on time, and then place into decorative truffle cups for gifting! This post contains affiliate links, which help to keep the site running! Please see my Disclosure Page for more information. Back to reality…2016 has been here for a couple of weeks now, the snow is piling up outside and my hands are itching to get back in the kitchen and make some goodies to post for ya’ll to enjoy! This year I decided not to make any “silly” resolutions like, I’m going to lose 20 pounds by February…or, I’m going to workout two times a day and fit into my honeymoon bikini (from 5 years ago!) and instead am choosing more grounded resolutions that I know I can achieve! Things like, I will take the time to do 5 minutes of deep breathing today, or I will stop and appreciate the nature around me at least once a day! Another huge one for me this year is to take the time I need to relax and de-stress to help lower my everyday anxiety…something that is going to be so much easier thanks to my family for getting me a large selection of adult colouring books for Christmas! I was so excited with each one I opened as I could just feel my stress melting away before even picking up a marker (I’ll post up some pictures once I get a few more done!). This is not to bash anyone who is doing the weight-loss resolutions, in fact, more power to you! I have just realized over the years that this is not one I stick to, and come December 31st I am depressed at the lack of achievements. With that being said…I have a delicious Chocolate Peanut Butter Cake that I want to share with you! I made this the other week for our Ukrainian Christmas get together with my dad, and it was a yummy hit! Christmas Baking Frenzy- Day 3!! Are you overloaded on sweets yet? I know, silly question right!? You can never have enough goodies this time of year! It seems as though everyday you get another invite to a dinner or cocktail party, at least you’ll be prepared with a tasty tray of sweets. Today’s post is…Peanut Butter Squares! Crunchy goodness, filled with the delicious taste of peanut butter, and topped with a nice hard icing! These are perfect on any tray, and have such a wonderful burst of flavour, best enjoyed with a nice glass of milk! The best part? I guarantee that you have all the ingredients you need already waiting in your pantry…so what are you waiting for? !